Menta, the Suffolk Enterprise Agency has recently started several new Menta Business Clubs with great success. The monthly clubs offer advice and help for people considering setting up a small business and dozens of people are already benefiting. The clubs cover business subjects including business planning, marketing, social media, and finance, web sites and media relations. In 2014 the clubs will be running specialist themed events with guest speakers providing free guidance at each one. In January Andrew Cooper from Greene & Greene Solicitors (Bury) will be on hand to offer free legal guidance for those wanting to start a business or to help develop their current business. The Menta Business Clubs are for people who have a great idea for a business but don’t know how to go about being their own boss. Bury St Edmunds: Menta, The Vision Centre, 5 Eastern Way, Bury St Edmunds, Thursday, January 9, 3pm–4.30pm. 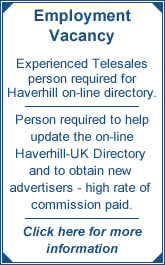 Haverhill: Menta Business Centre 2 Hollands Road, Haverhill, Thursday, January 9, 12.30pm–2pm. Sudbury: Sudbury Town Hall, Market Hill, Thursday, January 9, 10am-11.30am.